Okay you ladies know that I went to London recently right? Crown jewellery and regalia of the world by René Bruss, lists all the crown jewels of every country that ever had such items, (never mind if the countries are republics now or no longer exist) if they had a RF once the crown jewels are in here! From Russia to Lesotho and from Japan to Mexico it's all in this book. Jewels of the Tsars by Prince Michael of Greece, name says it all really, Russian bling and what happened to them after the revolution. Queens jewels by Vincent Meylan, Discusses the family jewels from the Bonapartes to the Romanovs to the Windsors and others. The most famous pieces are described in detail and photographed throughout their history. Royal Fabergé by Caroline the Guitaut, the book that came out together with the temporary expo of the pieces in BP, it is the guide for the show, gives detailed info and history on each piece and tells you how it ended up in the Royal collection. I always loved Fabergé but to see those magnificent piece 'life' is unbelievable! 'swoon' They are so beautiful, fragile and detailed.. just WOW! The thing that most of the pictures can't capture is the delicacy of the pieces because they use close-ups of the item to show the details, you forget the dimensions of it! Most of them are very small delicate objects of true mastership in the art of goldsmitting. Just finding this old thread. Sounds like you had a very 84 Charing Cross Road experience of London bookshops. Keep one suitcase empty just for the books. I did that one year when I visited NYC. Good list of titles to start a reading list for the new year. The Bruss one sounds especially good. I have the exhibit book from the sparkly Cartier exhibit that was in North America earlier this year. I keep watching for an inexpensive copy of The Queen's Jewels by Field. I've read it, so my overflowing bookcase can probably do without it for now. My favorite spot at library book sales is the Art book table, which is where I scored two Faberge books. 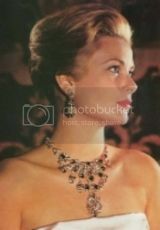 This book includes stories and pictures of jewels worn by members of the royal family for over 200 years.